We accept most insurance & handle all your paperwork. Specialty Services-Root Canals, Wisdom Teeth, Invisible Braces etc. $349 Teeth Whitening Special. Limited Time Offer! 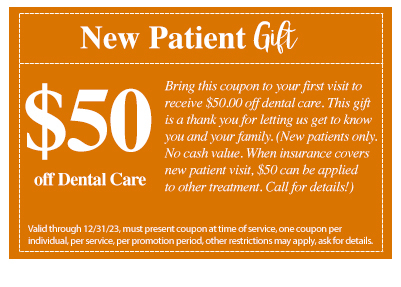 NEW PATIENT $50 GIFT CERTIFICATE. PLEASE PRINT IT OUT AND BRING TO YOUR APPOINTMENT TO REDEEM!